The thieving duo, Evans Ajaho, 30, and Isaiah Aigba, 21, who are alleged to ferry stolen motorcycles to Benin Republic for sale, were arrested at Baagbon Village in Odeda Local Government Area of the South Western state. Their arrest, according to police spokesperson, Abimbola Oyeyemi, followed a distress call made to the DPO in charge of Odeda Division, CSP Muhammad Baba Suleiman, that the suspects had snatched a Bajaj motorcycle at Alabata area of the local government at about 6:25 p.m on Wednesday, 25th of April. Oyeyemi, an ASP, explained that on the strength of the distress call, the DPO led his men to block all the exit points in the area and the hoodlums were subsequently apprehended with the motorcycle. 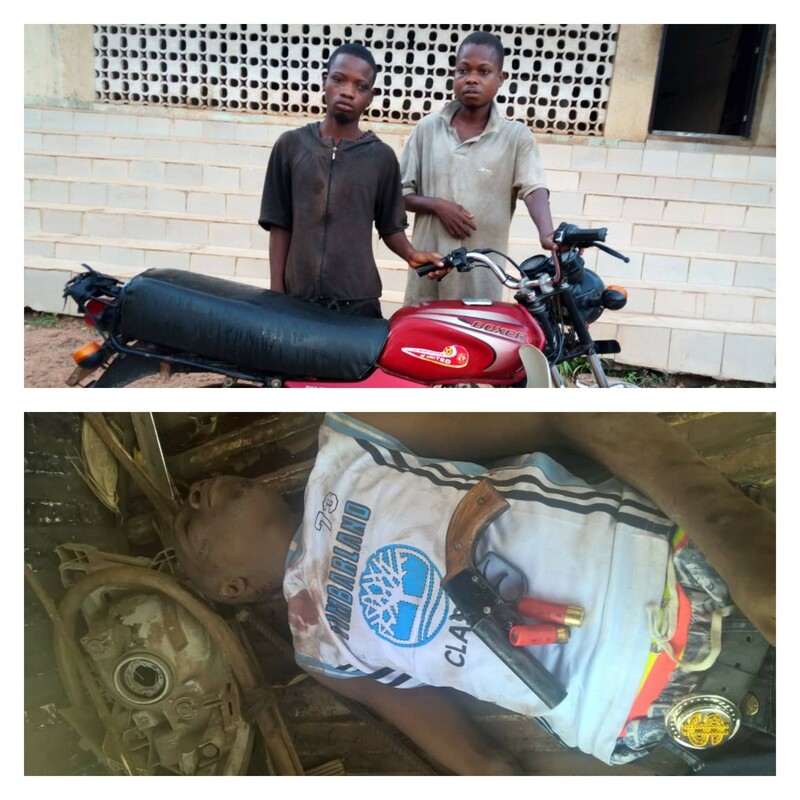 He stated further that on interrogation the two men confessed to have been in the business of motorcycle theft for quite sometime and that they have standby buyers in Benin Republic. Meanwhile, the Commissioner of Police in the state, Ahmed Iliyasu, has directed that the suspects be transferred to the office of Federal Special Anti Robbery Squad (FSARS) for further investigation and prosecution. In a related development, another motorcycle robber was reported to have died on Saturday, 28th of April, when the bike he snatched at gunpoint had an accident. The incident occurred around 4.45 p.m. at Abule Ijaye area of Lafenwa, Abeokuta, the state capital. The robber, who was said to have pretended to be a passenger, suddenly brought out a locally made double barrel pistol and demanded the commercial rider, one Toyin Ayoade, surrender his motorcycle. While the rider was struggling with him, he shot him on the hand and took possession of the motorcycle. A distress call was made, upon which the people of the community chased the motorcycle thief. It was while he was making away with the motorcycle that he crashed into a ditch and hit his head on a concrete culvert. He died on the spot. The police spokesperson detailed that, “recovered from the dead robber were one locally made double barrel pistol, two live cartridges and the snatched motorcycle. “The victim was later taken to the hospital by the DPO of Lafenwa Division, SP Mohammed Odunlami, and he is responding to treatment,” he PPRO stated.